SOTD : 9th February 2019. Pears ~ Transparent Soap. / Bloom Water Face Wash. Cold Water Face Rinse./ Homemade Lavender + Tea Tree Oil Witch Hazel Mixture./ Denim Original ASL. Nivea Men ~ Sensitive Cooling Post Shave Balm. 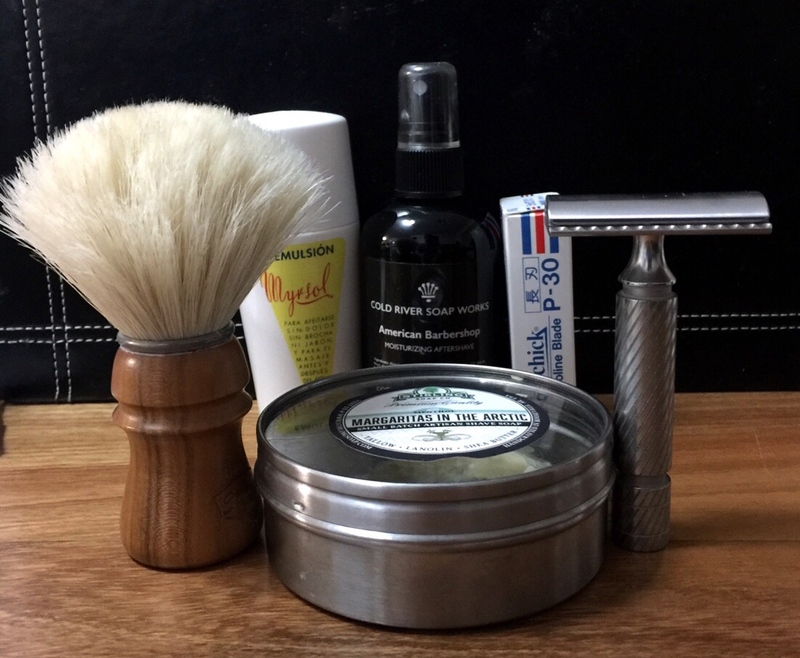 A new shave set up to start the weekend.and carrying on with using items within my shaving den that i've hardly gave any attention to. After having a very horrible experience with a derby extra blade,which resulted in giving me a nasty bite i was a little apprehensive using the derby premium on the first few strokes, but after that, i gained confidence very quickly because i now know if a blade is suited to my skin type or not in a few seconds the derby premium i found very smooth with no tuggy issues with a sharp efficient edge, which are completely different to it's sibling the Derby Extra, the blade also paired up superbly with my R41,with the lightest of touch both the razor & blade was a smooth duo slicing through my stubble with effortless ease. 1. 'Me, still learning my technique and not enough face preparation'. 2. 'I didn't have enough shaving confidence'. 3. ' Using a dodgy batch of blades, which does happen with any mass-produced DE blades'. The Derby premium at first glance i'll be honest and thought they where just re-packaged derby extra's, how wrong i was, ok they will never be my favourite de blades, and it's a classic case of YMMV, but as the saying goes, 'don't knock something, until you've tried it'. A surprisingly smooth shave, from the makers of probably the most love/hate DE razor blades on the market in the traditional wet shaving world. The kent soap like it's sibling MWF performed wonderfully, my skin type is really suited to soaps that contain Lanolin, if i had to pick one favourite soap both MWF & kent would be at the top of the list, along with Scottish Fine Soap & Monsavon, i could happily shave with any of these soaps forever, but like everyone else i like to use a variety of soaps & creams, and using the same soap or cream each time i shave would become predictable mundane & boring ,which traditional wet shaving should never become. A very comfortable 3 pass + pickups bbs shave with no errors to report. Finishing to the shave off with a generous dollop of Nivea Men ~ Sensitive Cooling Post Shave Balm. My face is feeling super smooth & smelling old school devine. Cyril Salter/ Maseto ED. 2 Band. I finished off my SE rotation with my favourite ER Razor , a Chrome SE from the New "Jewel " Combination Set, aka " Streamline ". 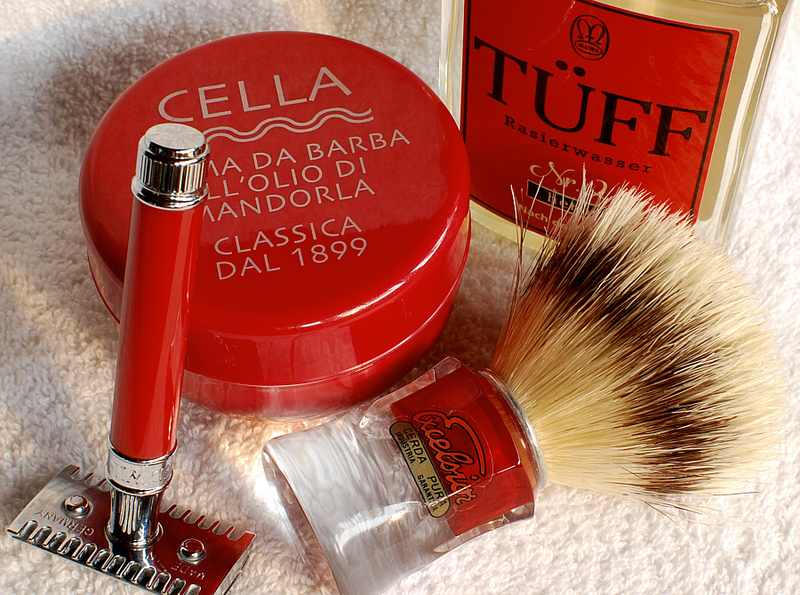 I had a good Shave yesterday with a 1912, but a shave with a "Streamline " takes it up a level. Used with care and a light touch it delivers superbly close all round Shaves. Today I had no problems, other than the fact that I might spend some time throughout the day indulging in some Face Stroking. By the way the Leather Case of unknown origin is a perfect fit for the ER case. T.O.B.S. 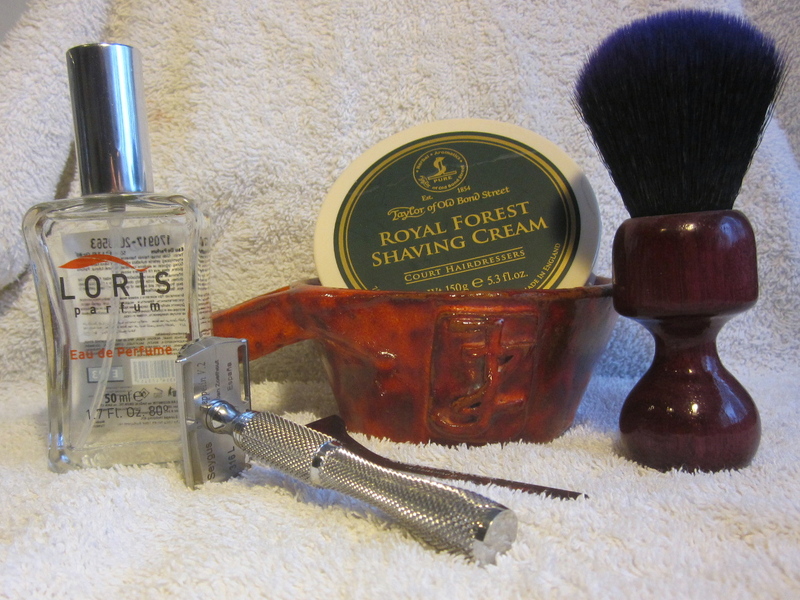 "Royal Forest" shaving cream. Seygus "Zeppelin" (gap 0.7 mm) / Stork "Taipan" handle. Cream: OSP Eucalyptus and Menthol. Post: Cold water, Natural Alum, Ibiza Aloe - Aloe Vera gel and Floid Vigoroso. A very relaxed 3 pass shave, looking forward to spending some time with SWMBO and the 6 nations this afternoon. I decided last night to save with the Dart today; its been a while - I love the weight of this razor and the construction - I feel it locks in the blade very well. WTG, ATG and XTG - BBS finish. I perhaps could have avoided the third pass on the neck - skin okay, feels a little tight. Good feedback from the alum block. Very easy two pass shave this morning. The Steampunk soap has a wonderful aroma that lingers in the bathroom for some time. First class shave. A very hot weekend here in Perth, so a mentholated soap was a blessed relief. Good old Stirling - such great soap; so consistently excellent. Three very comfortable passes for a BBS outcome. I'm enjoying being back in the SE groove. A nice Saturday shave which was a fine start to the day (and weekend). The TOBS Platinum Collection cream gives a nice soapy scent, and is becoming one of my staples. My Saturday Shave and a lovely one it was too. The Windrose has been hogging the limelight this trip, but this morning the R41 had a Turn. The Blackbird fits in well with the art on the Planet 9 labels, tried a Derby blade today which are usually a no go but worked quite well in the Blackbird, great performance as always from PAA soaps and a fantastic scent. Brush 24mm made by myself and the razor stand as well Wish I had the balm to go with the set.